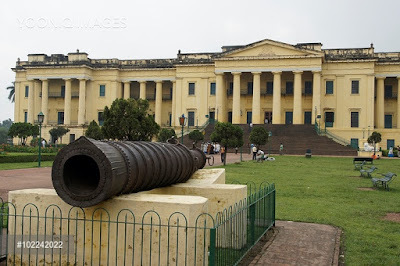 Though 180 years have gone by since the completion of Hazardurai palace (1837) in Murshidabad, West Bengal, the building has not yet lost either its aura or its historical significance. 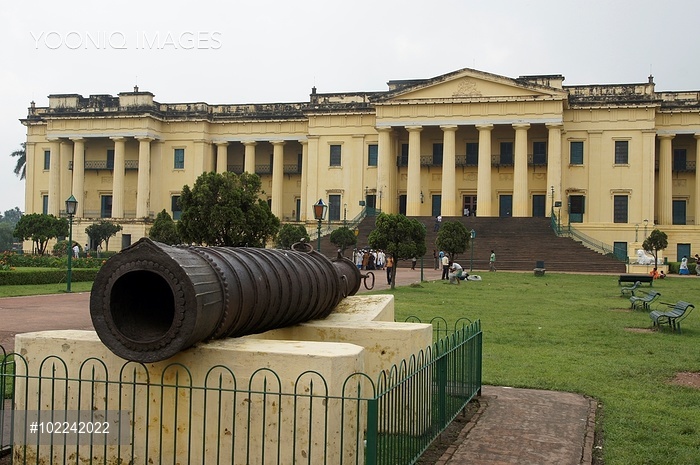 In a way, this palace, steeped in history, was connected with the birth of the British Empire when Bengal was annexed surreptitiously by the British. As for Britain, there was no turning back in her territorial expansion and it was her economic ascendancy all the way at the cost of India's degradation, exploitation and impoverishment. Britain's GDP had shot up rapidly once the Crown took over the administration from the East India company after 1857. This impressive palace was a silent spectator of the rise and fall of the British empire. 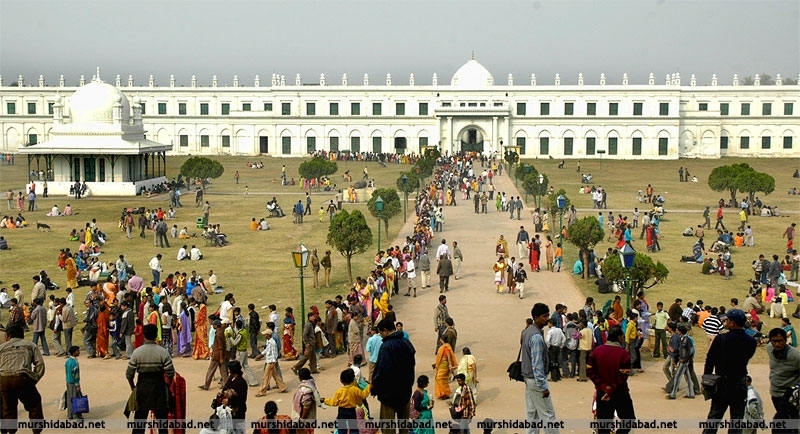 Hazarduari Palace, earlier known as the Bara Kothi, is in the area of Kila Nizamat in Murshidabad, West Bengal state and is the most impressive building in this part of the region. Built in the 19th century under the rule of Nawab Nazim Humayun Jah of Bengal, Bihar and Orissa (1824–1838), the main architect was one Duncan Macleod of the Bengal Corps of Engineers and it was on 9 August 1829, the foundation stone was laid by Nawab Nazim Humayun Jah himself during the administration of Governor General William Cavendish. The Nawob had to descend the ladder in to the deep trench to lay the foundation for the mammoth building. The construction was completed in December 1837. 01. 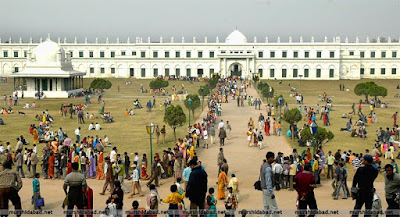 Hazarduari Palace, came up in the place where the old Nizamat Fort (Kila Nizamat or Nizamat Kila of of Murshidabad) had stood earlier on the banks of the Bhagirathi River. 02. The name Hazarduari Palace means a bulding with a thousand doors (Hazar means one thousand) as the palace has 1000 doors, among which 100 are false. The purpose was to avoid perpetrators who got into the palace to harm the ruler. Once inside the palace, they could not escape that easily as it was difficult to access the right exit door. Both the right and wrong doors would confuse them and the culprit would be caught red-handed. Incidentally, personally it will take hours to count each door and find out the right door to exit. 03. This palace was used by the Nawobs and later by the high ranking British officials as their residence. 04. The Nizamat Fort Area does not exist now and one can see it only in the painting . A painting of the Nizamat Fort Area (c. 1814–1815) is kept in the British Library by William Prinsep, showing the old and small Nizamat Fort. 05. Now, Kila Nizamat en composes the palace along with the Nizamat Imambara, Murshidabad Clock Tower, Madina Mosque, Chawk Masjid, Bacchawali Tope, the Shia Complex, Wasif Manzil, the two Zurud Mosques and the Nawab Bahadur's Institution (also called Nizamat College) surrounding it. 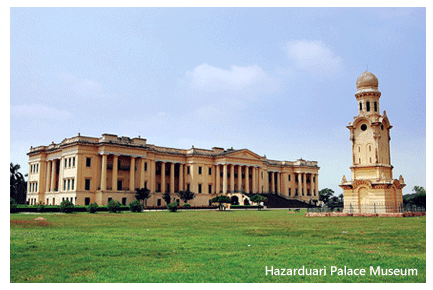 Hazarduari Palace is locally called the Nizamat Kila or the Kila Nizamat. 06. 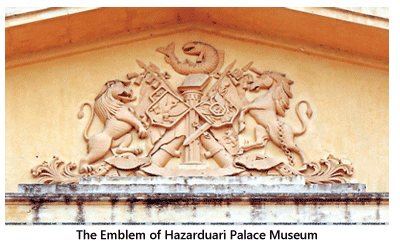 The palace is converted into a museum and it has superb collection of memorabilia right from the days of the British Raj. Lots of people visit the museum. style with eight galleries and 114 rooms, it is a a three-stored rectangular building lying amidst sprawling gardens. It has a colonnaded facade, a domed tower, high windows, beautifully ornate pillars and more, with artistically designed venue for the Nawab's durbar, that used to be held here. 08. The library houses many rare books and manuscripts. The museums collection of antiquities include various weapons, oil paintings of Dutch, French and Italian artists, marble statues, metal objects, porcelain and stucco statues, Farmans, rare books, old maps, manuscripts, land revenue records, palanquin, mostly belonging to eighteenth and nineteenth centuries. The exhibits are all on display in the Dining Room, the Landscape Gallery, the British Gallery, the Nawab Gallery, the Dewan Gallery, the Prince Gallery, the Committee Room, the Durbar Hall and other areas. The rooms are well embellished and well decorated. It shows how lavishly the Nawob lived and how affluent he was during his heyday. The Landscape Gallery has mainly landscape paintings in the palace collection. (a). Also on display (first floor) are the royal thrones, howdahs of silver and ivory, palanquins, phaetons and the powerful canons used in the battle like Plassey are quite impressive. (b). Second floor has 12,000 books and 3,000 manuscripts, in Persian, English, Arabic and Urdu. It includes priceless collection of manuscripts including Ain-e-Akbari and the Akbarnama, written by Akbar's court historian Abul Fazal; a copy of the Holy Koran penned by the emperor Aurangzeb. (c). Historical weapons (Amory wing A & B), include bow and arrow; swords and shields; lances and spears; knives and daggers; guns and rifles; pistols and revolvers, to wheels and cannons used in various battles. All of them carry inscriptions of the verses from the holy Koran. The powerful canons used in the battle against the British by the Nawob at places like Plassey and Buxar are quite impressive. (d). It also houses the sword of Alivardi Khan and multi-barrelled rifle, sword of Siraj-ud-Daulla, the Dagger by which Muhammad-i-Beg killed Siraj-ud-Daulla (at the instigation of the British). (e). Guns (match lock and flint lock), pistols of European and Indian origin (match lock, flint lock and percussion cap). (f). Among the items, the most amazing ones are the special testing plates that are believed to crack if poisoned food was served on it. (g). 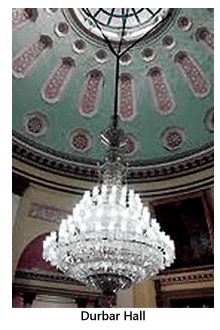 The Durbar hall has a large dazzling crystal Chandelier suspended in the center to illuminate the entire hall with ninety six lamps. The presence of a royal silver throne with its "Chattri" and a Durbari Hookah in front enhances the beauty of this hall. The intricate lattice work, gilded patterns in the marble platform and the marble candles bear testimony to the skill of the artisans. (h). The Halls of Royal has on display the masterpieces of paintings, silver and ivory objects, even metal and marble statues.and the Landscape Gallery has mainly landscape paintings in the palace collection. (i). The Archive Gallery has, among the treasures and manuscripts on art, culture, poetry, religion and medicines, etc., in Persian and Arabic language, rare and important farmans (Royal Orders), proclamations, indentures, formal letters, official correspondence etc. in Persian, the official language of the Mogul emperors and Nawabs. Some of them were in English. 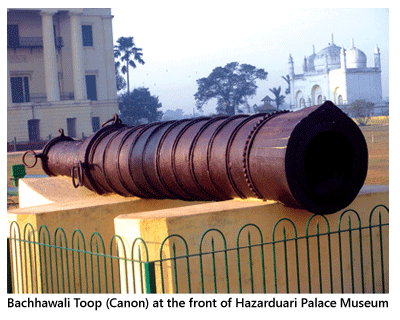 It shows the enormous powers vested with the Nawobs by the Mogul rulers in the governance of Bengal, Bihar and Orissa, their relations with the Companies and British administration, their agreements with British powers regarding administration and financial matters and many more aspects of the Nizamat. (j). Among them the most important document - the royal farman of Mughal emperor Shah Alam II (1765), Khat-i-Taziyat (Condolence letter) by Lord Minto on the death of Nawab's grandmother Babbu Begum dated (1809), Private letter of Lord Hastings to Nawab Mubarak Ali Khan date 1787-1788 are displayed here. (k). The Painting Gallery has a valuable collections that include "Holy Family" by Francesco Rinaldi, an enchanting and lively presentation of “Bacchus and Ariadne” which shows the Greek god of wine trying to induce Greek deity Ariadne, 'Cavaliers of Venice' by Marchetti, 'The Marquis of Spinola' by Van Dyke etc. In 1985, the palace was handed over to the Archaeological Survey of India for better preservation.